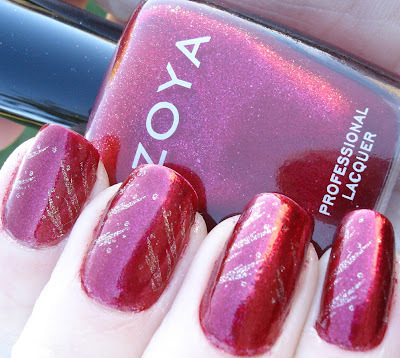 Polishology: Zoya Sarah is on Fire! Zoya Sarah is described by Zoya as 'pearls of dark fuchsia, red-violet, and ruby tones in a bright sparkle finish." I would say that description is fairly accurate. This is an absolutely gorgeous cool-toned red, with lots of sparkle packed in there! This is only my second Zoya ever, but I was once again totally impressed with the formula! It was highly pigmented, with one coat almost being enough and two bringing it to full opacity. Application was fabulous, as was dry time! In full sun it took on a brighter red coloration, and you can really see a golden color shining through. I would say the first picture is the most color accurate here. I wanted to keep the Konad for this subtle and not take over the whole nail, since I was loving the color so much. So I used OPI Glitzerland and Konad plate m73 to add little golden "flames" flickering on the sides of the nails. It gave the mani just that little bit extra, and I thought it was pretty gorgeous! It wore really well and I got several compliments on it. This one is so pretty! 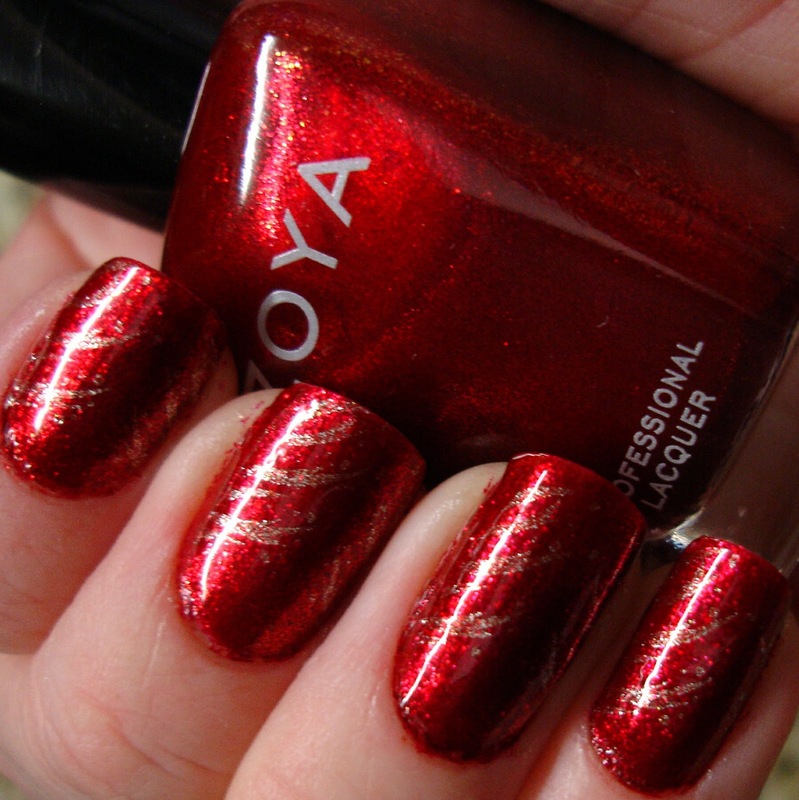 I want some Zoya!!! This one is in my untrieds...I hate red, but I want to wear it so. badly. It looks awesome on you!! 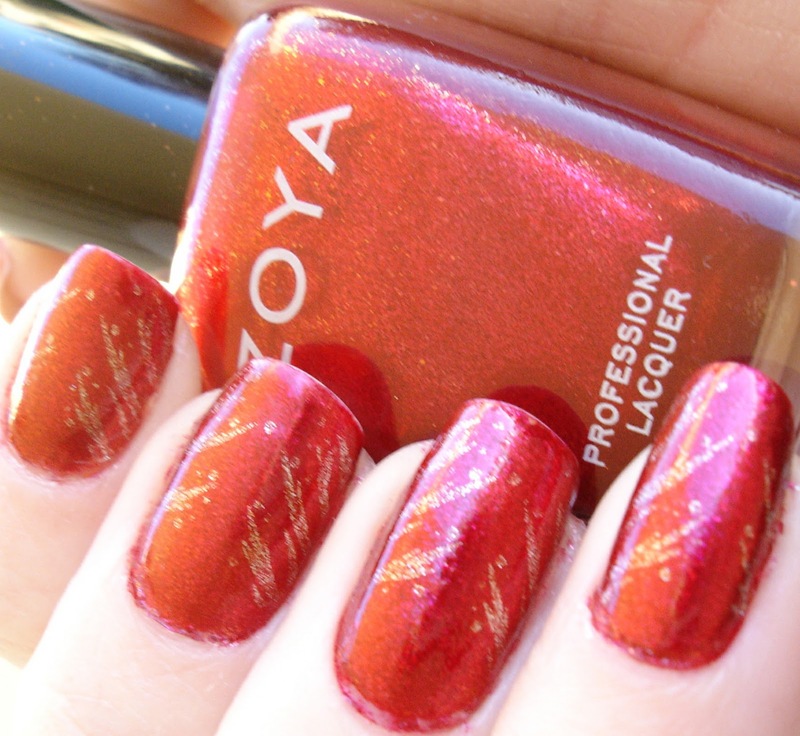 This Zoya is really pretty, I wish that they were cheaper where I live. ChaosButterfly - I normally don't do a lot of red either, but I have a few I really love. This is definitely one of them now! You have been challenged to THE DUEL!